Who can say no to a big fat slice of carrot cake loaded with white cream cheese frosting and a cute little orange frosting carrot on top? You’d be surprised - there’s a better alternative! 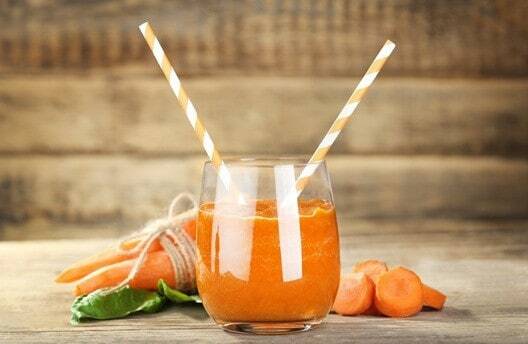 Choose a carrot cake smoothie recipe and you can have the same delicious dessert in a cup that is actually healthy for you. With ingredients like fresh carrot juice, creamy almond milk, your favorite carrot cake spices and other surprises, you can’t go wrong! 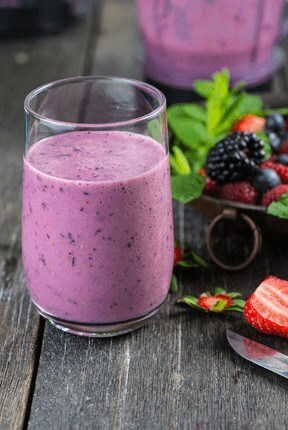 This delicious smoothie has only 207 calories and packs 17 grams of protein! Any type of milk will work. The banana here adds amazing creaminess. Place all ingredients into a high powdered blender and blend until smooth. If you want a well chilled smoothie, don’t put ice in it - it will dilute the taste of the fruits and veggies. Instead, freeze banana slices using the simple method here, then add them to your smoothie instead of ice. Your smoothie will be well chilled with a richer taste and texture. * Many thanks to our reader Deborah for the tip! With this recipe you can have your cake and eat it, too! You get fruits, veggie juice, and protein packed into one scrumptious smoothie. Feel free to swap out the green with whatever you have on hand. The sweetness of the carrots and fruits even masks the bitterness of kale. ⅛ tsp each of cinnamon, nutmeg, and ground cloves. Blend well, pour into a glass and enjoy! Vitamins, minerals, antioxidants, fiber, and omega-3. You’ll find them all in this healthy yet comfort food smoothie. The vitamin e, vitamin c, and beta-carotene are all great for your skin. Combine ingredients in blender and blend until desired consistency is achieved. Take your oatmeal to go in this fast and easy smoothie. This smoothie is loaded with fiber and guaranteed to keep you full until lunch. Some people prefer to cook their oatmeal before adding it to a smoothie. Personally, I just add a scoop right from the container and find that it contributes to the smoothie’s consistency quite nicely. A pinch of cinnamon, nutmeg, and ground cloves. 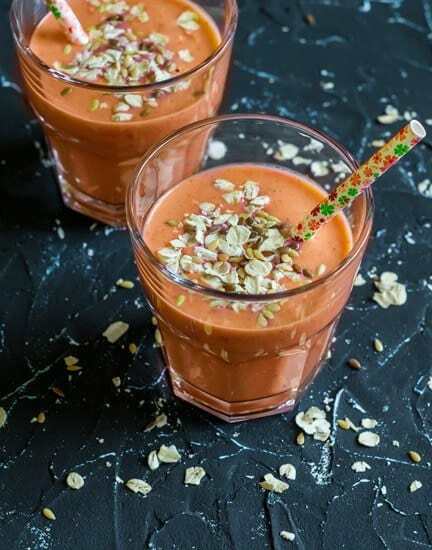 This delicious smoothie combines all the goodness of carrot cake with a little taste of tropics. 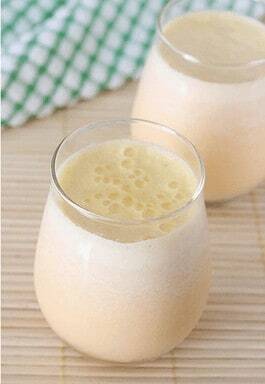 Coconut and pineapple provide plenty of manganese and an all natural sweetness to this creamy smoothie. Combine all ingredients except toasted coconut in blender. 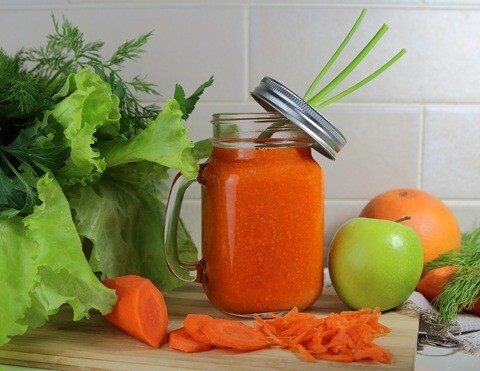 Blend on high until carrot is liquified. Pour into a large glass and top with toasted coconut. Kids won’t even realize they are getting two servings of veggies in this quick and easy smoothie. In addition, blueberries are a superfood - loaded with fiber and antioxidants! ½ cup frozen spinach until well blended. Nothing better than getting your veggies in the form of a milkshake! Cut down on prep time for this drink by soaking your almonds overnight and so they are ready to go for a breakfast shake. Or you can prep the entire milkshake and chill the whole thing over night. Wash and soak almonds for at least 4 hours. Remove the skin and set aside. Bring milk to a boil and add sugar. Simmer the milk for about 5 minutes, stirring constantly. Add sliced carrots, almonds and cardamom powder. Switch off the stove. Keep the pan covered and set aside to cool. It can be refrigerated as well. 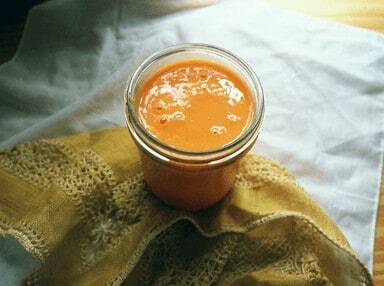 Blend almonds, carrots and half of the milk to smooth puree. Then add the rest of the milk and blend once more. 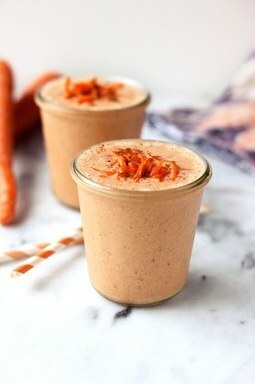 Serve carrot milkshake chilled or at room temperature. This smoothie is great for boosting immunity since it is packed with vitamin a and vitamin c. In addition, both the yogurt and almond milk add a calcium boost that growing kids need. Carrots - 3 big, whole, chunky ones. 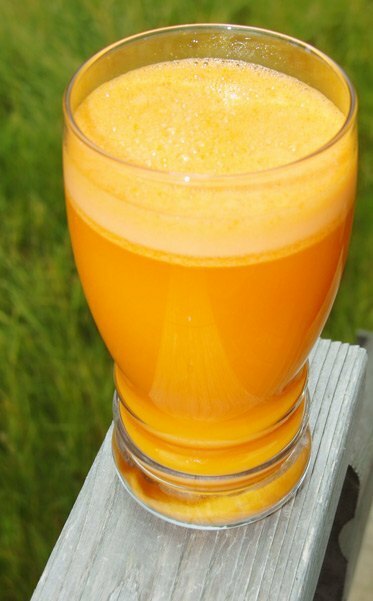 Put the carrots through a juicer. 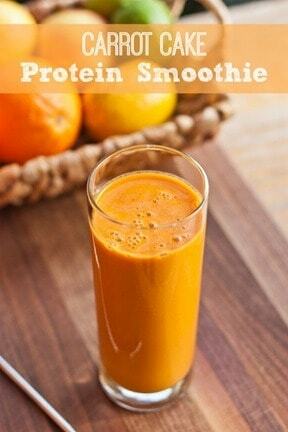 Add the carrot juice, mango, yogurt, honey, almond milk, and ice cubes to a blender. Dates, cashews, hemp seeds, and ginger. This smoothie requires a bit of prep work and some out of the ordinary ingredients, but is completely worth the extra effort. Homemade almond milk is definitely ideal but store bought will do the trick, too. Add all of the ingredients to your high speed blender and process until smooth and creamy. Top with a little cinnamon and a pinch of grated carrots. Enjoy immediately. Optional – instead of the hemp seeds, for additional nutritional support, you could also opt for a scoop of Vega Plant-Based Protein Powder, either the Vanilla Chai or straight Vanilla would be great. 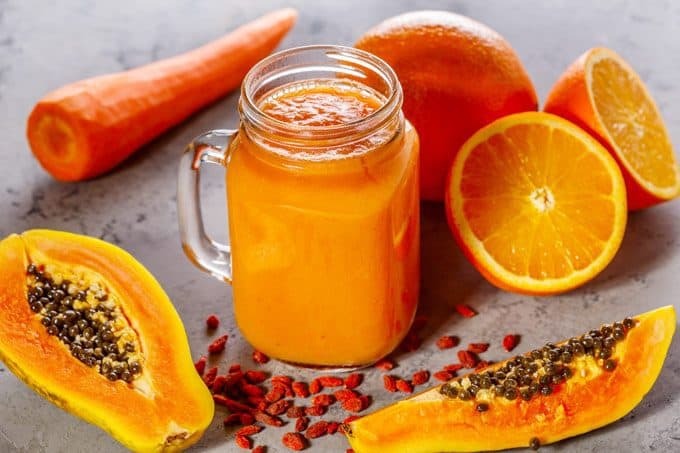 This smoothie uses Vega Vanilla Chai protein powder which packs in 20 grams of protein plus vitamins and minerals, omega-3 fatty acids and probiotics. You can use any other protein powder you like. Blend well, pour into a glass and savor! These recipes allow you to enjoy the flavors of carrot cake at any time of the day. 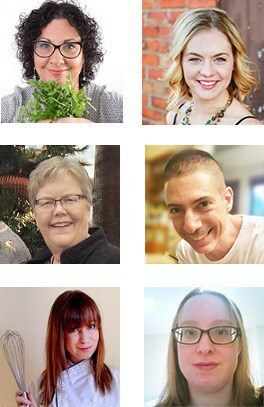 They will cure your sweet tooth without the refined sugars and regret that can come from indulging in carrot cake. 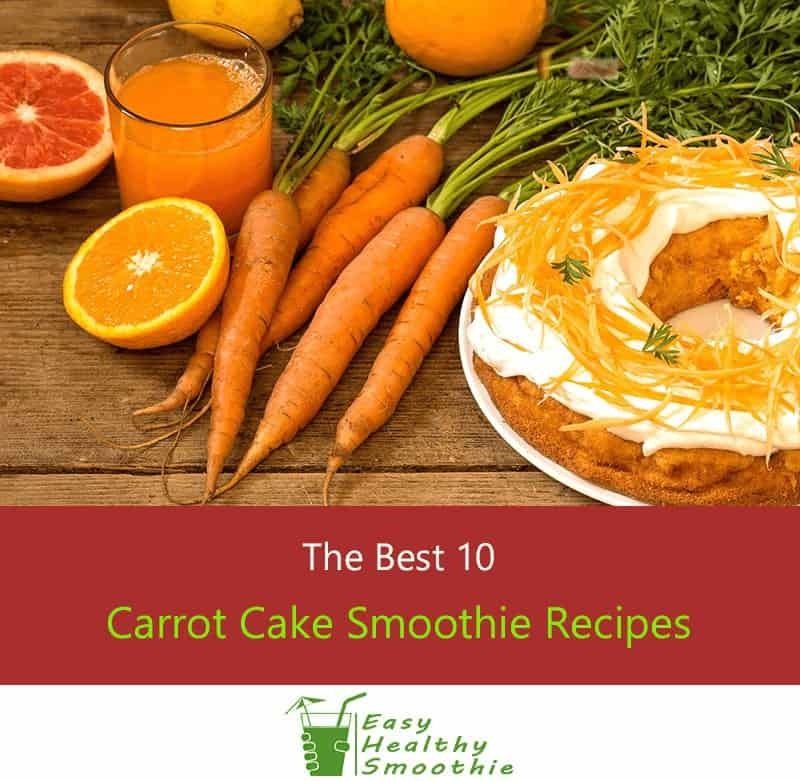 Enjoy all of the traditional flavors of a homemade carrot cake, in a super healthy smoothie version that’s yummy, easy and quick to make! Wow, these sound like an awesome way to get a sweet hit that’s actually healthy. My usual choice has been something like vanilla but I think some of these recipes are quickly going to become my new favorites when my willpower starts to wane! Hi Mike, if you’re a big fan of carrot cake I’m pretty sure you’re going to absolutely love these smoothies! Love to get your thoughts once you’ve tried some of them! I love carrot cake and have really missed swapping it for things like smoothies. How awesome to know I can have the best of both worlds! Definitely want to try some of these pretty soon! Thanks for your comment, Peter! It definitely sounds much naughtier than it is, right?